Send beautiful and happy Hanukkah greetings around the world in seconds with e-cards from the top sites. Eight days of light and more light and ever more light brighten the oft-dark days and long nights of Kislev and Tevet; latkes, applesauce, and sufganiyot (and some more latkes perhaps) sweeten the tongue and palate; and four-lettered tops spinning shorten the time (and bring some chocolaty Hanukkah gelt perhaps): it's Hanukkah. You can spread the shining light with hanukkiah candles in your window, of course; you can also spread the light (or the dreidels and ponchkes — well, images of them at least) and spread it further even with an electronic greeting. Here are some of my favorite Hanukkah e-card sending sites from across the web for wishing a festive holiday and much happiness. Be prepared: you may want to touch the screen to feel if the cards are real. Shaped in the fashion of physical cards made from heavy paper, Punchbowl cards certainly do look the part. For Hanukkah, they come in wonderfully graphic and enticingly ornamental designs. You pick the font and colors, rubber and postage stamps, writing and, in some cases, a photo to include. It's flashing and (en-)lightening everywhere, but there's also enough room for peaceful Hanukkah blessings in BlueMountain.com's Hanukkah section of holiday greetings. Someecard.com's honesty is disarming at Hanukkah, too. The Paperless Post's Hanukkah cards shine with meticulous typography and marvelous imagery — some of which can be your own. Under the menorah lighting up house and window, a cat plays with the Dreidel in one of the warmly drawn and spiritedly animated Hanukkah greeting cards at Ojolie. Brightly blue and shining white, the wonderfully designed Hanukkah cards at Pingg.com can be used as invitations to, say, a game of dreidel. Send a neatly painted Hanukkah frenzy with dreidels and menorah from Katie's Cards. Light up the peace with warm wishes or the snow of happiness. 123Greetings.com has the right card for just about every Hanukkah taste. Everything's a-twistin' when the dreidel spins. At VerveCards, colors convene, shaped into many a latke, fantastic candles or, of course, hippie Hanukkah. Light, peace, and happiness. That's what Hanukkah is all about, and it also sums up the Hanukkah greetings American Greetings has put up for sending very well. Simple, enticing and with just the hint of a wink, Just Wink's Hanukkah cards are fun to send and receive. Glowing light and rich colors make for a peaceful and heartfelt Hanukkah in the animated atmgreetings.com e-cards. Even if you do not fancy starring in a rap, hora dance, or Christmas song video this Hanukkah, you can find an entertaining Hanukkah greeting card or video to send. Lots of Hanukkah fun and pun at JibJab. Classy designs mixed with charm make nice Hanukkah greetings at Plaxo. Filled with quirk and fun and love, BirthdayAlarm.com's cards make Hanukkah a joyful affair for sender and, it is to be hoped, recipient alike. Are you feeling cartoonish? Find a card that fits that mood at DoozyCards.com and send it easily to spread Hanukkah cheer. Send the glow and glee of Hanukkah with a pick from Hallmark's appealing and expertly done greeting card collection. Show you care for Hanukkah with these nice and friendly cards and for the environment as Care2 donate part of their revenue to environmental organizations. The lyric qualities of a heartfelt "Happy Hanukkah" are accompanied by animations (but not obliterated by them) and simple, but gripping images in the Hanukkah cards at 1001 Postcards. Sweet, simple and topical Hanukkah greetings from Hillel, a Jewish campus life organization. Animate the lights for Hanukkah with Kisseo's e-cards — and it is, indeed, mostly lights and candles in these neatly drawn greetings. The dreidel dances better in 3D! At GreetingSpring, it sings, too, for a happy Hanukkah. 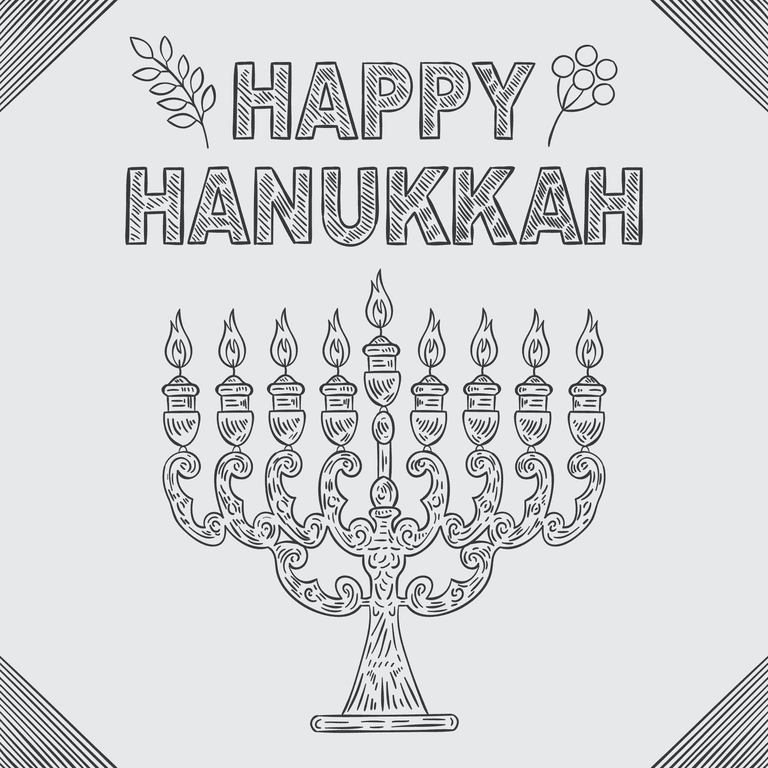 Simple images aplenty and some animation, too, let you send swift and charming Hanukkah greetings from the original e-cards.com site. Simple subjects can nice Hanukkah greetings make. At CrossCards, you will find just such subjects turned into just such e-cards. Share Hanukkah fun with the most quirky cards found at Regards.com. At HiGreetings.com, you can pick from many a Hanukkah greeting to send. Many cards come as videos, many include music, and some are simple, peaceful messages. At Deepestfeelings, Hanukkah is a festival of lights and delights you can send by e-card. Be it a sole candle or fireworks, the festival of lights of glowing.